I enjoy playing with words but sometimes I also find words challenging. Writing poems helps me to master language, my emotions and my experience. And it's also a lot of fun. Especially when I get to perform. I started writing poetry as a teenager, secretly in a notebook, hidden under the bed. (This is rubbish place to hide something by the way - to my horror one of my mates found it and read it!) I began writing because I was feeling low at the time and writing poems seemed to help. I used to number them but when I got up to about 200, I stopped counting. Perhaps I got so miserable I didn't care! I'm a lot happier now but I've completely lost count of my age let alone how many poems I've written. I still keep a notebook and I try to write something everyday. I studied poems at school but - well that's the problem, I studied them - I don't think poems are written to be studied, poems are written to be experienced or enjoyed, they are written to make you think but also feel. To laugh or cry, maybe. I liked the First World War poets anyway and a bit of Shakespeare. But I only met my favourite poets when I came across the performance poetry scene. The first poet I saw perform was Attila The Stockbroker, who was angry and loud and sang, rapped and read his rhymes. He was my favourite poet for a time. And I also saw Jackie Kay who (although billed as a poet doing a reading rather than a performance poet) drew me in with her liveliness and warmth as well as her brilliant writing and later, the comic poet John Hegley who made me laugh, a lot! These days there are so many poets I've seen and worked with who are among my favourites but I think the best thing is not just to read and study poetry but to watch a poet LIVE while they are still ALIVE! What a cheeky question! I feel very honoured to even have made ANY money from poetry, but this is not a job you do if you want to be rich. It's a very uncertain way to make a living, but I do it because having tried out a few other jobs I feel this is the best way I can make a contribution to the world. And mostly because I CAN'T HELP IT! DO YOU PREFER WRITING BOOKS OR SHOWS? When I was a child I wanted to be an actor. My dad was encouraging - he built me a wooden toy theatre and I used to put on shows for my family at Christmas - but he didn't think it was a good idea for me to do it for money! (Probably based on the quality of those shows!) I was going to do it anyway but then lost confidence so I went off to do some voluntary work and then to Bradford University to do Applied Social Studies. But the appeal of performance poetry has always been as much about the performance as the poetry for me. I absolutely love writing and performing shows in theatres because it makes me think that I am doing what I've always wanted to do after all! That said, by the time I'd done 15 years of gigs and shows, it started to bother me that I hadn't got a book published. So I am really proud that The Dictionary Of Dads was published by Otter-Barry Books this year. I didn't start out writing poems for children but pretty early on (when I was hosting an open-mike evening in Hastings) a teacher saw me and suggested I come into her primary school and perform. I didn't think I had any suitable poems but I manage to survive fifteen minutes in front of the children and they didn't seem to stop laughing, so I thought this is tremendous fun, I'm going to do more of this. I still write some poems for adults but most of my work now is focussed on young people or family audiences. It's great that you can do some really silly poems with children and then in the course of the same performance touch on more serious subjects like dyslexia, bullying or whatever. It's great going into schools and writing poems with young people too. 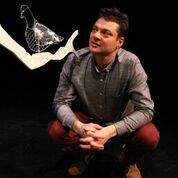 And I am particularly enjoying my spoken word shows with Half Moon, using poetry to tell fictional stories like my latest show Young Herbert's Horrors. Usually I just write about everyday things that happen to me or respond to random thoughts in my head. But when I'm chosing a theme to write about for a longer piece it tends to be something I am very interested in and often something I have direct experience of. My first show The Jumble Book was about dyslexia and I was able to build on my own experiences around having a specific learning disability. I wrote about being the smallest kid in school in Big Wow Small Wonder because I was the smallest kid in school for a long time! Then of course you make up some stuff to make the story as interesting as you can but I think having a strong connection to the subject you are writing about gives the story the feeling of authenticity it needs to thrive as poetry theatre. And yet, I have also contributed to projects like One Way Ticket where I had to write and perform the part of a boy from the 1950's who was sent away to a brutal institution in Australia. Luckily, nothing like what happened to him has ever happened to me, so for this role I had to draw on what I read and heard about the experiences of those children. I think this sort of thing is an example of how empathy and listening in a poet can be as important as the skills we have in playing with words and using our voice.